Africa is a land of great diversity. It is the second largest continent in the world. If you were to travel through the 53 countries of Africa, you would see many things. The weather ranges from very hot desert climate to wet rainforests to permanently frozen glaciers. The landforms include tropical islands, flat plains, and very steep mountains. The people of Africa are just as diverse. There are over a thousand languages spoken in Africa. People come from many tribes. They practice many religions. They hold a variety of jobs, from simple farming to service jobs in teaching and medicine to industrial jobs. Despite all this diversity, Africa has a strong identity as a continent. 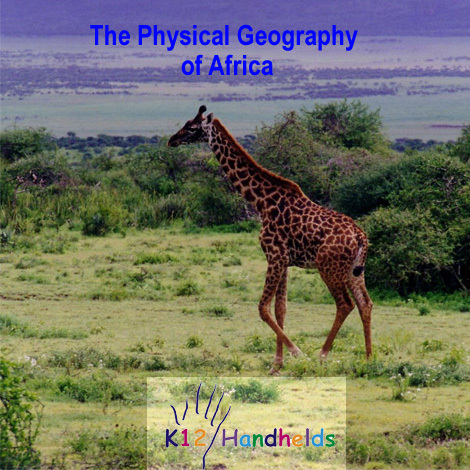 This book will look at the physical geography of Africa and how it has affected life there. Africa is very large. It is over 5,000 miles from the top to the bottom and over three times as big as the United States. The equator runs through the middle of Africa. Most of the continent is between the Tropic of Cancer and the Tropic of Capricorn. Africa is surrounded by water. To the west is the Atlantic Ocean. To the east is the Indian Ocean. The northern side of the continent is bordered by the Mediterranean Sea and the Red Sea. There are six countries in Africa that are islands, including Madagascar, a large island to the southeast. Much of Africa is covered by plateaus. These are flat or gently rolling areas of land that are relatively high in elevation. Much of the southern and eastern parts of Africa are high plateaus. The east region has the highest elevations on the continent. 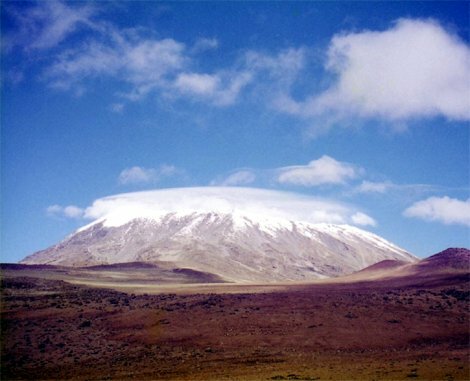 The eastern region is also home to the highest mountain in Africa, Mount Kilimanjaro. This mountain is 19,341 feet above sea level. It is very cold at the top with snow and glaciers present all year round. The land at the bottom of the mountain is a warm and tropical rainforest. Mount Kilimanjaro is on the edge of the Great Rift Valley, also in the east region. This is one of the most distinct physical features of Africa. It is a very large valley formed by the earth’s crust pulling apart. The Great Rift Valley begins in Syria north of Africa and goes all the way down to Mozambique in the south region. It is over 4,000 miles long. Some of Africa’s largest lakes are found near the Great Rift Valley. Africa is the home of the longest river in the world, the Nile River. The Nile begins with the merging of two tributaries, the White Nile and the Blue Nile. It then flows over 4,000 miles to empty into the Mediterranean Sea in Egypt in the north. Farmers have grown crops along the Nile for thousands of years because of the rich fertile soil there. The Congo River flows through rainforests in central Africa. It flows out to the Atlantic Ocean. The watershed it drains is very large. Two other important rivers in Africa are the Niger River and the Zambezi River. The Niger River is the third longest river in Africa. It runs through west Africa and empties into the Atlantic in Nigeria. The Zambezi is the fourth longest river and is in southern region. There are many waterfalls on this river, including the beautiful and dramatic Victoria Falls. The coast of Africa is very even with few natural harbors. Along the coast is a thin strip of coastal plain. This quickly rises to the plateau. There are also deserts in Africa. 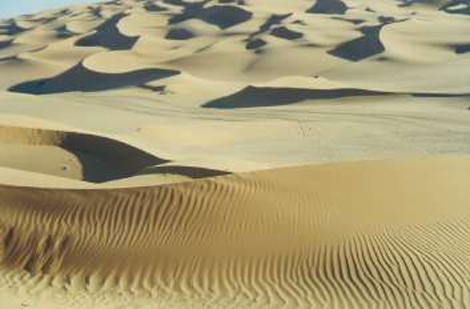 The Sahara Desert is the world’s largest. It covers much of north Africa and is nearly as big as the United States. The area where the Sahara meets the savanna is called the Sahel. This area is hot and dry, getting only a few inches of rain a year. There are also two smaller deserts in the southern region of Africa. The Namib Desert runs along the Atlantic coast from Angola through Namibia. Also, in the south, the Kalahari Desert includes parts of Botswana, Namibia, and South Africa. 1. Which body of water does not border Africa? 2. Most of Africa is ___. 3. Which of the following physical features is not found in Africa? 4. What is the longest river in Africa? 5. Which region is mostly desert? 6. Which region has the highest elevation in Africa? There are many factors that affect climate. In Africa, the two most important are distance from the equator and elevation. Areas near to the equator generally have warmer climates. This is because the sun’s rays are more direct there. (This is true in the United States as well. The warmer parts of our country are in the south, which is closer to the equator. This includes places like Florida, the Gulf Coast, the southwest, and southern California.) 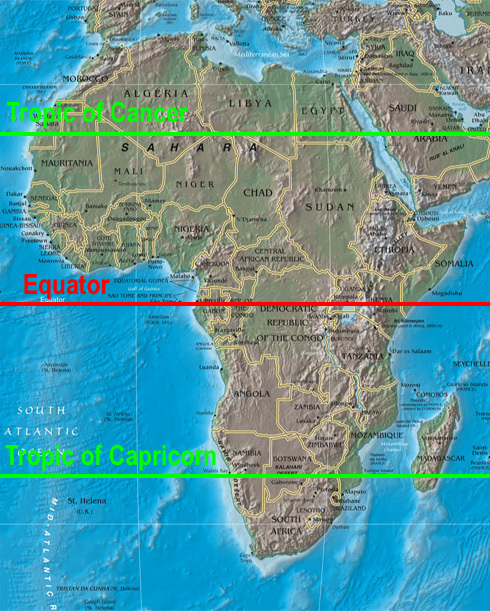 Areas between the Tropic of Cancer and the Tropic of Capricorn, which includes most of Africa, have tropical climates. Seasons are also more extreme as you get further north or south of the equator. In addition, the northern hemisphere (where the U.S. is) has winter from December through March. In the southern hemisphere, the seasons are the opposite—December is summer there. Because Africa is in the tropics, the temperatures tend to be relatively moderate. However, there are still parts of Africa that are very cold. Some even have snow all year round! This is primarily because of elevation or the height of the land above sea level. Higher elevations tend to be colder than lower elevations. (That’s why there is often snow at the tops of mountains.) The areas of Africa that have higher elevations, like the plateau highlands in the east, tend to be cooler. Rainfall in Africa varies a great deal. In the dry deserts like the Sahara and Namib, there is very little rain. Droughts can be a huge problem in these areas. The coastal regions tend to have a great deal of rain, because the air picks up moisture from the ocean. In other areas of Africa, there is often a rainy season, when most of the rain falls, followed by a dryer period. The precipitation and temperature greatly affect what kind of plants or vegetation grow in different regions. In the tropical regions where there is at least 60 inches of rain a year, tropical rainforests grow. There are large rainforests in central and west Africa, including much of the Congo basin. The rainforest is home to a large number of plants and animals. 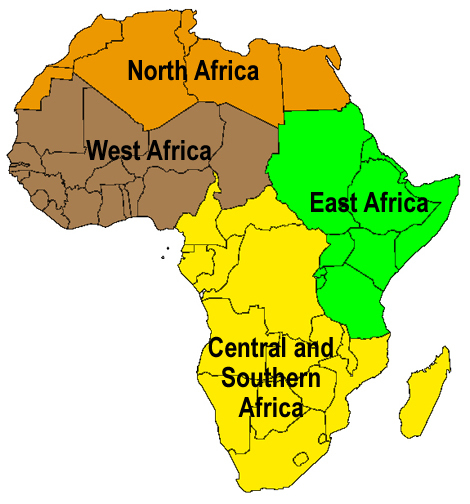 Tropical savannas cover much of central, south and west Africa. These are large grassy areas with occasional trees and bushes. Because these areas are large and have ample grass, they are good homes for large animals, such as giraffes, zebras, and elephants. Many of the images of Africa that you might see on television or in the movies are of the savannas. The deserts in Africa are hot and dry and do not support many plants or animals. Life there is very harsh. Some areas of the desert are just empty expanses of sand. Other areas have grasses and small shrubs growing. Desert trees must adapt by having deep root systems, thick bark, and small leaves that don’t give up much water. The climatic conditions greatly affect the people who live in Africa. Most people in Africa are subsistence farmers. That means that they grow enough food to eat and that is their primary occupation. The common staple crops in Africa are corn, cassava (a root vegetable like a potato), and rice. There are also some crops that are grown in Africa for export to other countries. These are called cash crops. They include coffee, tea, cacao, peanuts, cotton, and sisal (a fiber used to make rope). Much of Africa lacks modern farming technology and good transportation systems, so commercial agriculture is not widespread. The fluctuation in world prices of these crops is also a problem. In many areas of Africa, the rain is unpredictable. That is difficult for farmers. Too little or too much rain can result in not enough food. During some years, famine is a problem that takes many lives. In areas like the deserts that do not have enough rain to support agriculture, other means of living are necessary. Most people who live in the desert are nomads. They travel from place to place, often herding animals like camels, goats, and sheep. Their movements are planned according to where there will be water. Africa is a land rich in natural resources, though not all of them have been fully taken advantage of. While the economies of most African countries are based on subsistence farming, these resources are also an important part of national economies. Minerals and crude oil are abundant in much of Africa. In the north region, petroleum is found in Libya, Algeria, and Egypt. There are also oil reserves in the west in Nigeria, Angola, Gabon, and the Republic of the Congo. Natural gas is also found in Algeria. The southern region is a significant source of diamonds, gold, copper, and bauxite. These minerals are exported. Many of the countries that run the large mining operations are foreign-owned. As a result, the profits often leave Africa. Also, as with agriculture, world price changes can have a negative effect on local African economies. All four region of Africa have forests that can produce wood for export. Many trees have been cut down and sold to other countries. However, in order for this to be a sustainable resource, the cut trees must be replaced. If new trees are not planted, there will be none to sell in the future. African nations are starting to see the value of planting trees and guarding other resources, so that they are available for future generations. Another great natural resource of Africa is its national parks. 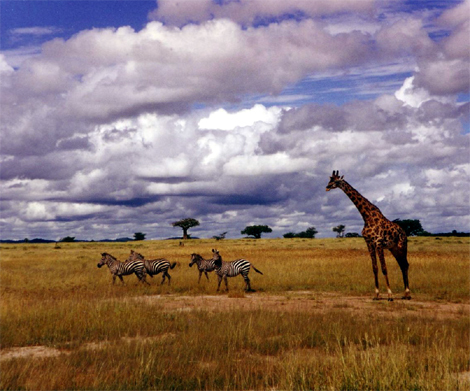 Especially in east, southern, and central Africa, the national parks attract visitors from around the world. They come to see the lions, zebras, elephants, and other animals that can’t be seen anywhere else. In the past, hunting and habitat destruction threatened these animals. More recently, African governments have recognized the importance of conservation and are protecting these resources. Another great potential resource is hydroelectric power. Africa has many large rivers. As local energy needs grow and as the world energy markets tighten, hydroelectric power is an important resource. Because it is a renewable energy source, it has many advantages over fossil fuels like coal, gas, or oil. As Africa continues to grow and develop, it is important that they diversify their economy. As long as the economy relies on subsistence farming, it will be subject to problems like drought. However, if the economy expands to include things like more manufacturing, services, energy production, and tourism, Africa will be stronger. 7. What factors affect climate the most in Africa? 8. It is warmest ___. 9. Most Africans work in ___. 10. What are the main staple crops of Africa? 11. Which of these is not a natural resource of Africa? 12. What renewable source of energy is promising for Africa in the future? 1 – Based on a map from the 2004 CIA World Factbook.